Darwinists who want to make a strong case for evolution will routinely avoid certain biological topics—chiefly because those topics resist all gradualist explanations. One is the unique and complex method by which insects grow. Metamorphosis (from Greek words meaning ‘change of form’), describes how most insects change from juveniles to adults, often developing adult body structures and ways of life completely different from those of their youth. While the juvenile of a particular species may look like a glorified worm, the adult might have five-centimetre (2-inch) wings and no functioning jaws. Let’s examine the life of a moth. In order for a tiny, newly hatched caterpillar to grow into a brilliant moth or butterfly, it must first become fat—very fat. In fact, the caterpillar seems to have only two preoccupations in life: eating and moulting. Although mammals, fish, birds, and reptiles have skeletons that support their body, arthropods—including insects—do not. Instead, God designed them with a hard skin or shell called an exoskeleton. A caterpillar’s exoskeleton may seem soft, but it gives the caterpillar its entire shape (which sometimes includes fleshy spikes or horns). Yet it remains flexible enough to allow for gymnastic stretches toward high leaves. Further, the exoskeleton doesn’t grow; a larger exoskeleton forms folded beneath the smaller one. Meanwhile, deep within the caterpillar’s body are clusters of cells—imaginal discs. These are positioned to grow into wings, jointed legs, and compound eyes. After the caterpillar has moulted into its largest body size, it prepares to become a pupa by spinning a cocoon, burrowing underground, or in the case of most butterflies, forming a chrysalis. As it lies there very still, hormones from within the caterpillar’s brain signal the body to develop into the adult stage.2 These cause the imaginal discs to burst into action, forming antennae, scaled wings, reproductive organs, and every other body part needed by the adult. Even the muscular system must be reorganized to accommodate the wings. Some muscles are destroyed, some are ‘reconstructed,’ and others are formed brand new.3 When the adult moth or butterfly emerges, it looks nothing like the squirmy worm it once was. 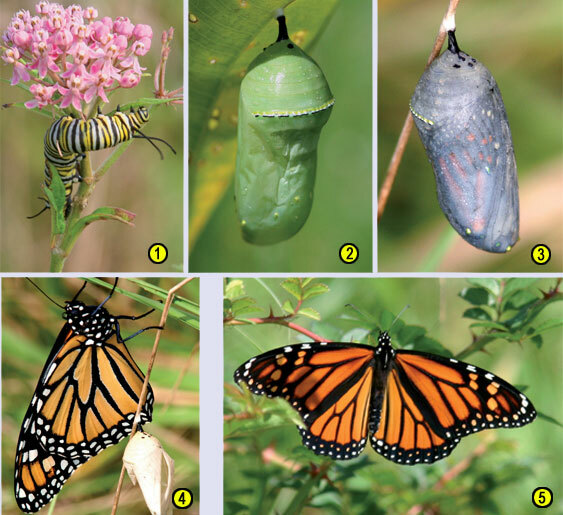 The type of metamorphosis described above, which insects like moths, butterflies, bees, flies and ants undergo, is known as ‘complete’ metamorphosis and involves four stages: egg (1), larva (2), pupa (3) and adult (4). In the case of a moth, the caterpillar is the larva, the cocoon is the pupa, and the colorful winged creature you might catch in a net is the adult. However, a second type of metamorphosis is used by insects such as termites, grasshoppers, crickets, cicadas and aphids. This involves changing from egg (1) to nymph (2) to adult (3)—only three stages. This ‘incomplete’ metamorphosis does not involve a pupa. The nymph simply looks like a miniature adult, and as it moults it grows progressively larger, until it reaches its adult form with fully developed wings and reproductive organs. Each stage in the insect’s life is crucial. Darwinists face colossal problems when they attempt to explain the origin of metamorphosis in terms of random mutation and natural selection, because any gap or error in the cycle normally kills the insect or prevents reproduction. If a caterpillar can’t squeeze out of its old exoskeleton, if it isn’t able to form a cocoon or chrysalis, or if it fails to rearrange muscles and grow body parts as a pupa, it dies. It never becomes an adult, and therefore it does not reproduce itself. Mayflies are falsely called ‘the most primitive winged insects’, but they are not primitive at all. The aquatic larvae of such insects as mayflies and mosquitoes are especially troublesome for evolutionists. Mayflies are falsely called ‘the most primitive winged insects’,5 but they are not primitive at all. Rather, they live two or three years underwater breathing with gills like fish, then emerge as adults into the air. Then they live only one day to swarm, mate, and lay eggs. Unless ants had a complex, interdependent society from the very beginning, how did ‘ancient’ ant larvae survive? 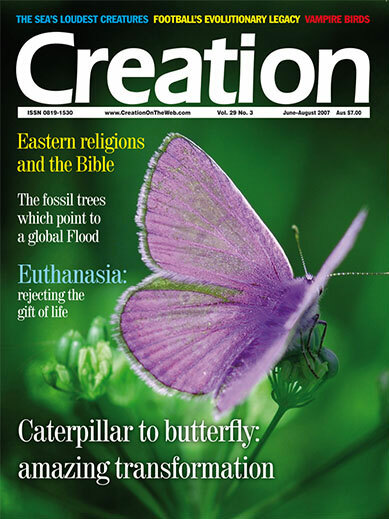 The Bible has the only plausible answer: God created them to be social from the start, just like He created caterpillars to gorge, mayfly nymphs to swim, and moths to fly and reproduce. The characteristics of the stages of metamorphosis did not evolve randomly over time. From egg to adult, insects live out the unique plans designed for them by God. Photos by Bob Moul, <www.Pbase.com/rcm1840>. Monarch caterpillar (larva), feeding on milkweed plant leaves. The larva hatches from the egg, and remains in this stage for about two weeks, although this depends on temperature. The caterpillars then attach themselves head down to a convenient twig. They shed their outer skin and make a cocoon, to transform into a pupa (chrysalis). Here the most amazing transformation occurs, where most of the caterpillar tissues dissolve and are re-formed into a butterfly—under its genetic program. At first it looks like a waxy jade vase. Monarch Pupa moments before butterfly emerges. As the metamorphosis progresses, the chrysalis becomes increasingly transparent, so the colours of the butterfly can be seen. Just after this photo was taken, the butterfly emerged. Freshly Emerged Monarch with chrysalis shell. After 9–15 days, the butterfly finally emerges. It inflates its wings by pumping blood from a pool of blood it has stored in its abdomen into the wing veins (below left). The butterfly waits until its wings stiffen and dry before it flies away to start the cycle of life all over again. 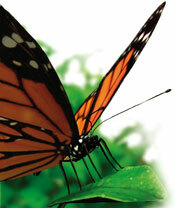 Thicker veins and the lack of the nodes on the upper hind wing veins distinguish the female from male Monarch. 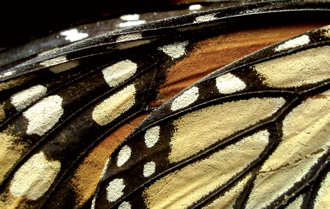 Can evolution explain complete metamorphosis? In a 1999 issue of Nature, two scientists (James Truman & Lynn Riddiford) presented their hypothesis of how complete insect metamorphosis evolved. In the article the authors tried to explain the evolution of four-stage metamorphosis from three-stage metamorphosis by proposing that the latter actually contains four stages.1 They called this arbitrarily-defined fourth stage the ‘pronymph’, and described it to be a period which always precedes the first moult, and which varies in duration among different species, sometimes ending as soon as the insect hatches out of its egg.2 This ‘pronymph’, they argued, evolved into our modern larva. In plainer terms, some ancient insect hatched out of its egg too soon and began groping around for food. It continued evolving until it could spend many weeks in this premature, caterpillar-like form, before finally metamorphosing into the long-belated nymph stage—which according to the authors had shortened and evolved into our modern pupa. One fatal problem with this idea is that the underdeveloped ‘pronymph’, as described in Nature, doesn’t eat! It would need a fully formed digestive tract and the capability to bite, chew and swallow if it were to survive and grow into an adult. Truman and Riddiford argued that the ‘pronymph’ overcame these difficulties and gradually evolved until it could eat, move, and presumably defend itself. Defence is very important in a world of ‘survival of the fittest’, and it boggles the mind how the first premature ‘pronymph’ was safer and better favoured by evolution than a normal, fully developed nymph! A better explanation is that four-stage metamorphosis was created independently and completely functional. Truman, J.W. and Riddiford, L.M., The origins of insect metamorphosis, Nature 401(6752):447–452, 30 September 1999. Goor, R. and N., Insect metamorphosis: from egg to adult, Atheneum, New York, pp. 6–8, 1990. Return to text. Wigglesworth, V.B., Insect hormones, Scientific Publications Department, Carolina Biological Supply Company, Oxford University Press, 1983. Return to text. Chapman, R.F., The insects: structure and function, The English Universities Press Ltd, London, pp. 410–415, 1969. Return to text. Farb, P., The insects, Life Nature Library, Time-Life Books, New York, p. 61, 1962. Return to text. Burnie, D. and Wilson, D., Animal, Smithsonian Institution, Dorling Kindersley, New York, p. 551, 2001. Return to text. Ref. 4, p. 145. Return to text. Ref. 4, p. 142. Return to text. Doering, H. and McCormick, J.M., An ant is born, Sterling Publishing Co., Inc., New York, pp. 7–16, 1973. Return to text.